Ben Loudenslager and Karsten Strobel measure their Tower for competition during the Centerville Science Olympiad Invitational last Saturday. The pair placed third in the event. 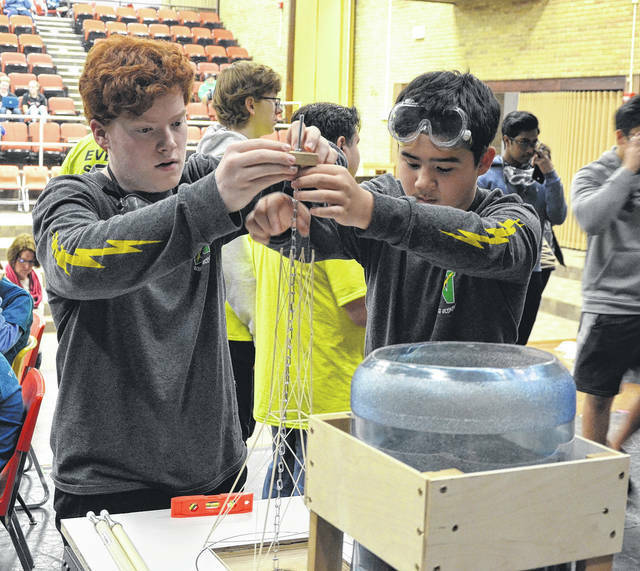 CENTERVILLE — The Northmont Science Olympiad teams continued its season by placing in the top half of the field in the Centerville Science Olympiad Invitational held at Centerville High School, on January 27. This Invitational was exceptionally difficult, as the competition field included nine teams who were champions in their home states in 2017. The state champion teams hailed from Illinois (two teams), Kentucky, Michigan (two teams), North Carolina, Ohio (two teams) and Texas. The Northmont teams finished in the top half of the field, with Northmont High School earning 739 points, and placing 28th out of 64 high school teams participating; while the top Northmont Middle School team won 631 points, and finished 27th out of 63 middle school teams competing. Centerville High School won the first place score of the day, with 99 points. However, in keeping with traditional Science Olympiad competition courtesy, the home team did not take the trophy; thus the first place trophy went to Mentor High School, coming in second with 222 points. In the Middle School competition, Beckendorff Junior High, 2017 Texas State Champions, won the division with 122 points. In total, Northmont took home medals or ribbons in five of the 23 events of the day. Northmont showed our strength with our build event teams, with multiple sets of winners. In the “Towers” event, eighth grader Ben Loudenslager and sixth grader Karsten Strobel won the bronze third place medal; followed by eighth grade teammates Jocelynn Asbra and Natalie Canterbury, who placed fifth. In addition, at the High School, the fourth place “Towers” ribbon went to Northmont Senior James Bousquette and Junior Ian Underburger. In “The Wright Stuff” event, eighth grade teammates Jack Knudsen and Connor Zechar brought home the fifth place ribbon. Finally, in “Hovercraft,” Zechar, paired with seventh grader Kaley Underwood, won sixth; and eighth grader Parker Anderson, paired with Asbra, won eighth. The Northmont Middle School team will next travel to Ionia, Michigan for competition in February. The Northmont Science Olympiad teams are generously funded through support of many local businesses, the Northmont Rotary Club, and several private local donors. Students interested in science are encouraged to contact their guidance office in the fall of the year, to learn information about the Northmont Science Olympiad teams.